In its Bach Cantata Program, St Johns Southgate presents an ongoing series of services incorporating the choral music of J.S. Bach. 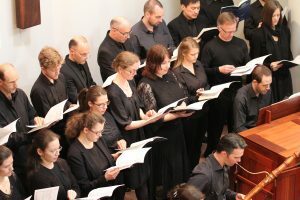 The cantatas are presented in their intended context, liturgical Lutheran church services. The services include congregational liturgy and chorales, and organ music on the 1992 Knud Smenge pipe organ. The program was founded in 1997 and 2019 is its 22nd liturgical year. The series has presented over 125 different cantatas and most of Bach’s major choral works in over 190 events. The series features the St Johns Bach Choir and Orchestra directed by St Johns’ Director of Music, Graham Lieschke. The St Johns Bach Orchestra plays on period instruments. St Johns has a collection of period instruments including a chamber organ, harpsichord, pair of oboes da caccia, set of baroque timpani, two cornetti and a specialised recorder. Some works are presented in collaboration with other groups. A long-standing collaboration with the University of Melbourne involves students of the Early Music Studio of the Melbourne Conservatorium of Music. The program located below is organised on a rolling basis. Translations and notes on Bach cantatas are available here. Services include an opportunity to make offerings and donations to support the St Johns Bach Program, or you can make a tax-deductible donation through the St Johns Southgate Bach Foundation. Free parking (up to a limit) is available at all service times. The St Johns Bach Choir is a selected/auditioned semi-professional choir formed in 1998 for the Bach Cantata Program. Many of its members participate in other fine vocal ensembles in Melbourne. To express interest in joining the choir, contact the church office. The St Johns Bach Orchestra draws on the pool of highly skilled period instrument players in Melbourne and Australia. 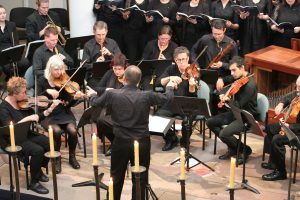 It was formed under the directorship of Dr Graham Lieschke to support the Bach cantata program, and is now one of the most established period baroque instrumental orchestras in Melbourne. Its core of regular players is joined from time-to-time by local and international visiting artists.